What a shock for you! I'm so sorry. May God give you abundant peace as you work through the grief. Losing my mother caused me to lose my passion for blogging and I still haven't recovered it now 9 months later. Wondering if I ever will. Dear Ayla, you have my deepest sympathies. I'm so sorry about your mom. I am in tears for you as I can totally relate to the similar passing of my own mother many years ago. It broke my heart that I wasn't with her, like you planning to travel back to visit again. I am so sorry and send my sincere condolences to you and your family at this heart breaking time. Concentrate on the love around you and all the wonderful times shared. Be kind to yourself. I am so very sorry about your loss. I hope, in time, you find comfort in this truth: She was looking forward to your visit. That positive light brightened your mother's final days. Sending you and yours my sincerest condolences on the passing of your mother. Ayla, my heart aches for you in this great time of loss. It is my hope that the knowledge that you were there for your mother when she needed you most when the diagnosis was made and then you spent that great week with her. So tough for you that she went so suddenly as you were preparing to spend more time visiting her, but how wonderful that your Mom was anticipating your visit, and I am sure this gave her great joy. We don't know why the timing was as it was, but as you have said--you are grateful she did not suffer as she likely would have if she had continued to live. Try and rest in the comfort that she was hopeful because of your visit, and that you were there for her when she needed you the most. Such a shock when someone even when that person is known to be very ill, but to have her pass away so suddenly is so difficult. But clearly this was meant to be. My thoughts and prayers to you and your family during these difficult, challenging days. We have all missed you so much, but you were exactly where you needed to be, Ayla. Sending my deepest condolences to you and to your family. I feel for you, Ayla. (((hugs))) from Wyoming. I'm so very sorry, Ayla! Praying for peace and strength for you and your family! Please accept my heartfelt condolences for the loss of your dear mother. Thank you for sharing your lovely spirit wonderful recipes and with us. Thank you for posting the lovely photo of you and your mom. My heart aches for you. I am so sorry for the loss of your Mother ... peace be with you and your family. I am deeply sorry for your loss Ayla. I'm praying that she is at peace and you will be comforted by family and friends. This is one of the hardest times in your life.....even harder with the suddenness of it. Our hearts go out to you. Soon you will be able to laugh and talk together about memories but for now know we are all thinking about you through this difficult time. Hugs to you. Nothing is harder I think than losing a parent long before you expect to. Please accept my sympathy, stay strong and I wish you peace. I am so sorry to hear of your loss. It is never easy to lose a parent, no matter what their age. Stay strong and peace to you and your family. Oh my, I knew it was something bad but never dreamed it would have been this so soon. I am so sorry your family had this to face. That c word is an awful thing. So cruel to the patient and the family. May GOD be ever near at this time. Thanks for sharing at this difficult time. I am so sorry to read this sad news. I will lift you and your family up in prayer to help you face the difficult days ahead. May your many wonderful memories give you comfort as you keep her close with them. You're blog & posts are so wonderful, how you share with all your pictures I hope that we your cyber friends help to comfort you in some small way. I'm so very sorry for the loss of your precious mother. The unexpectedness of it makes it doubly difficult for you. You were blessed to be able to be there for her when it really mattered and she was blessed by your presence. She was looking forward so much to your return visit. I'm sure those things gave her great comfort. I love the wonderful photo you posted ... it speaks volumes. It seems that you and I have been on a similar journey. We lost my sweet mom on December 2. The circumstances were different, though. Mom had been in gradually failing health for a long time but was doing OK. She took a "turn" the week before Thanksgiving and it became obvious that her time was growing short. Then almost 2 weeks later she "suddenly" was no longer with us. I'll never forget how much fun she had on her 98th birthday this past July, and how she loved the Bundt cake I'd made from your recipe ... the one you helped me "tweak" into a lemon cake. You will always be a part of my memories of that lovely day in her life. You and your family will be in my thoughts and prayers as you travel this difficult road. Oh Ayla, I'm so very sorry to hear of your loss. Praying for peace of heart and mind for you and yours. HUGS! So sorry for your loss. Praying that you will feel God's comfort and peace. Ayla, I'm so sorry for your loss and will keep you and yours in my thoughts and prayers. I've experienced the loss of both of my parents and know the pain you feel. May the good Lord give you the strength and peace you need now and always. Hugs to you. I'm so very sorry, Ayla. My heart goes out to you as you grieve this profound loss. I am so sorry you are going through this sad sad time. I will be praying for you and your family! I just trust God to comfort you and give you the strength and peace that you so need at this time. You are loved by so many!!! Ayla, I'm so sorry for your loss. My heart aches for you. You will be in my thoughts and prayers. Hugs to you. 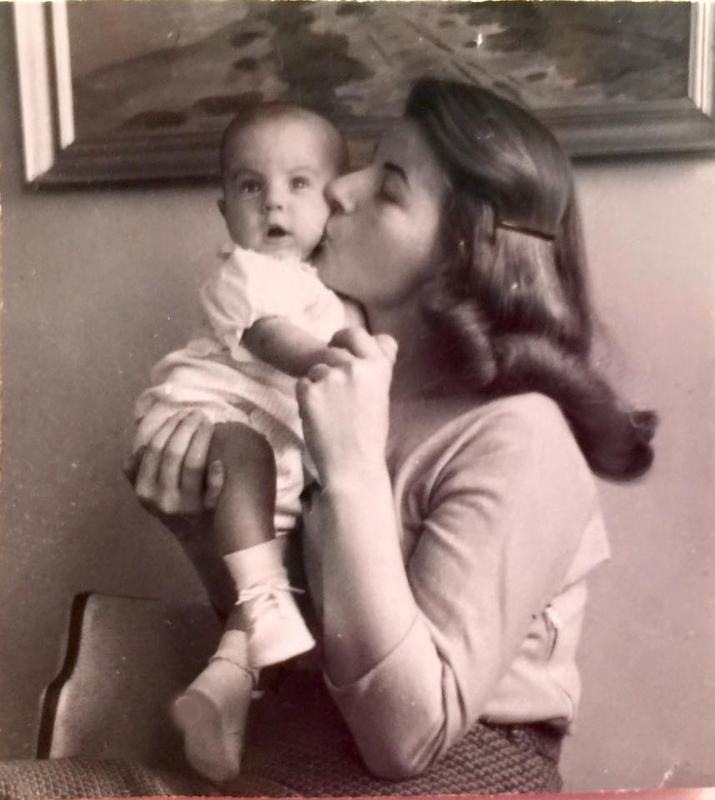 I hope your mom knew how your gift for cooking and writing (that she must have helped nurture as you were growing up) has touched and made so many lives healthier and happier. Ayla, I am so very sorry for the loss of your beloved Mother. May God shower you and your family with peace, strength and comfort. Prayers to you, Ayla, and your family and may you have the strength through the holiday time to be with those who love and embrace you. My wishes are heartfelt as you have been in my home for years now teaching me about cooking wheat-free and you are loved and appreciated. (((((Big Hugs!)))) Sandy P.
Thinking of you this morning. LOT of love and prayers from Canada for you and your family. Ayla, I am sorry to read of the sudden loss of your Mother. My most heartfelt sympathies. I know your Mother must have been a very special lady to have raised a daughter such as you. Your warmth and caring come across loud and clear through your website. It must be so painful to lose your Mom especially during the Christmas season but hopefully you are comforted in knowing she is not in pain and is in God's paradise now. The separation is only temporary and until you meet again, please feel all the love and prayers that are being sent you and your family's way! God Bless! Ayla, I'm so very, very sorry. Ayla, I am very sorry to read of your loss. My condolences. I am so sorry for your loss, Ayla. I love the picture you included. She was a beautiful woman who obviously loved being a mom. I sure understand your grateful/sad emotions. Having lost my mom 4 years ago before Thanksgiving was difficult. As the family gathered together that Thursday, I drew comfort in seeing her sweet spirit in each of her 7 children and her many grandchildren. What a gift of life and love she gave us. Like you, we were blessed to have the mom we did! Dear Ayla, I pray God will comfort you and strengthen you with His presence during this terribly sad time in your life. Blessings. Oh Ayla, I am so sorry to hear of your loss. How wonderful you had that one precious week together. My thoughts and prayers are with you and your family. Love and hugs to you! Ayla, I'm so sorry to hear about your loss. You are in my thoughts and prayers! I am so sorry about your mother. I love the photo you posted with your entry. She obviously loved you so much and that will never end. Thinking about you and your family and praying God will comfort you. A big cyber-hug sent your way! Thinking of you and your family as our year draws to an end. Praying for God to bring you all the strength and comfort that you need. The photo you shared of you and your Mom is so beautiful. Thank you for sharing it here with us. May God bless you deeply. I am following your blog for more than two years. I was worried that why you haven't updated your blog. Now I got it... I am really sorry for your loss! No one can replace your Mom's place in your life... But I have strong hope in the God's word the Bible. I would like to share a scripture that is found in the Books of Acts chapter 24 verse 15. "And I have hope toward God, which hope these men also look forward to, that there is going to be a resurrection of both the righteous and the unrighteous." So according to this verse the Bible promises that we're going to see all our dead loved ones back again that too in the earth in Paradise condition!! Have hope that you will see your Mom again and you both will share lots of hugs and kisses!!! Ayla I am so sorry to hear about your Mom's passing. My heart goes out to you at this difficult time. I hope that you wonderful memories will give you strength to go on. I have been praying for strength for you. Prayers for you as you begin to mourn. God's grace was manifested in her passing without much suffering, but we know you are hurting. May you experience his peace in this difficult time. i'm holding you and your family in my heart during this time. may Love and Grace support you in your grieving process. My prayers are with you and your family during this difficult time. You mom will always be with you in spirit. All love and support.